In his graphic work, the artist and Bauhaus teacher, Josef Albers, chose the theme ambiguous geometric forms, which change between figure and background. 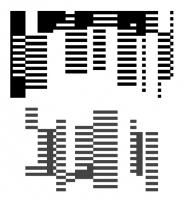 In his crosshatch pictures white lines change on black background in rhythmic sequence with black lines on white background. Through the constant inverting of the colours, neither a picture figure nor a picture background can be clearly defined, which is why the gaze of the viewer oscillates between foreground and background, surface and depth, light and shadow. These dynamic effects of the area should be transferred in the space. The starting point of the short-term design is, in each case, drawing from Albers, which is spatially interpreted and transformed into a folded paper structure. The fold organises the surface in the space. The space formed by the folding of the material cannot be classified by the categories from above and below, outside and inside. Instead, the opposing areas merge into intersections of a continuous space. Folds are "blurred" objects, which create ambivalent, overlapping spatial zones. Time is registered in the form by the folding of the materials as the forth dimension. The shaping process can be read from the folded object, so that it can theoretically be further developed endlessly. The folding formation technique is not so much aimed at the creation of a final, solid form as it is aimed at the development of a temporary, alterable figure.